Perhaps not THE cloud exactly (already an overused term for any remote computing), but some wireless infrastructure companies are proposing a new architecture for RANs (radio access networks), that would replace today's terrestrial cell site base stations with remote clusters of centralized virtual base stations. 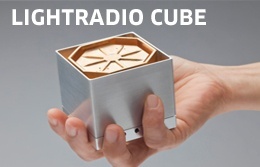 The C-RAN (cloud RAN) concept has received increased attention since the 2011 MWC (Mobile World Congress), where Alcatel-Lucent (along with Freescale and HP) introduced their novel lightRadio™cube. lightRadio represents a new architecture where the base station, typically located at the base of each cell site tower, is broken into its components elements and then distributed into both the antenna and throughout a cloud-like network. Shortly after MWC, Alcatel-Lucent announced that they would collaborate with China Mobile to develop "C-RAN" (cloud RAN) technology, citing benefits of C-RAN as a "green" technology that would also "improve network quality and coverage, reduce transmission resource consumption and lower OPEX by up to 50% and CAPEX by 15%". The China Mobile Research Institute had presented the C-RAN concept earlier, at a workshop in Beijing which they hosted in April 2010. Kent Fisher, solution architect in the Networking Components Division at LSI, reviewed the C-RAN concept in his presentation on the "Evolution of Wireless Infrastructure" at the Linley Tech Carrier Conference in San Jose on June 8. The EE Daily News spoke with Mr. Fisher to discuss his presentation. According to Fisher, one of the challenges in RAN design is dealing with RF (radio frequency) interference, which can limit network capacity. Operators also find it difficult to find the space to install base station enclosures in dense urban areas, and they incur high OPEX (operating expenses) from site lease fees and high energy consumption - which is also detrimental to the environment. A typical cell site may also have low average utilization, while base station designers must meet peak network load requirements and support subscriber mobility. In the C-RAN concept, base station enclosures at cellular towers are eliminated by distributing only RRH (Remote Radio Head) units, such as the Alcatel-Lucent lightCube, which reduces power consumption and occupies only a small amount of space at the cell site. The RRHs can be mounted directly on poles. Designers can also employ wideband radio technology in the RRH to support multiple frequency bands, such as in multi-mode 3G/4G installations. Because of the high-data rates in 4G networks, network engineers must connect the RRH to a centralized processing pool of virtual base stations through an optical fiber transport network, using the CPRI (common public radio) interface or OBSAI (Open Base Station Architecture Initiative). Data compression will be required to reduce bandwidth and transport costs. This requirement for a fiber-connected topology is likely to limit the use of C-RAN to dense urban centers, and in 'greenfield' installations that lack any pre-existing network infrastructure. However, engineers deploying C-RANs can take advantage of two Bell Labs (now Alcatel-Lucent) technologies to increase capacity and achieve higher spectral efficiency, through the use of CoMP (coordinated multi-point) transmission, and ICIC (inter-cell interference coordination) in the virtual base-station pool. 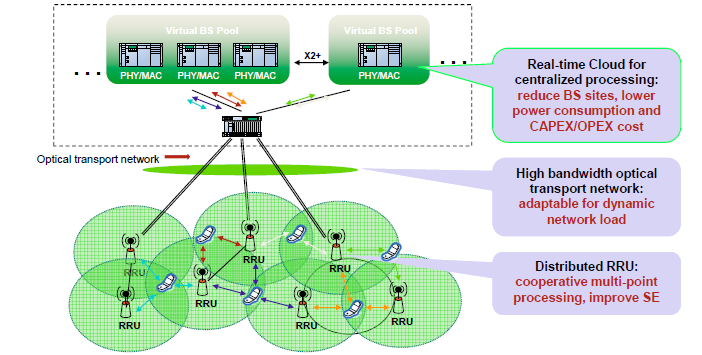 According to an Alcatel-Lucent whitepaper, in dense urban areas with a large number of RRHs deployed, network engineers can use the pooling capability of a centralized processing center to dynamically manage load variations across a number of baseband processing elements. This can result in resource savings of typically 10 to 20 percent, according to Alcatel-Lucent. Of course, designers will need more powerful communications processors to handle the more sophisticated processing functions of a C-RAN. LSI's Fisher proposed the company's Axxia device as well-suited for such applications. LSI integrates IBM's PowerPC® 476 cores in the Axxis SoC, in up to a quad configuration, with up to a 1.8GHz operating frequency. To handle network layer-2 and layer-3 processing, LSI adds acceleration engines for functions such as packet processing (20 Gb/s), a security engine (10 Gb/s), and a traffic manager/scheduler with up to 6 levels of hierarchy.